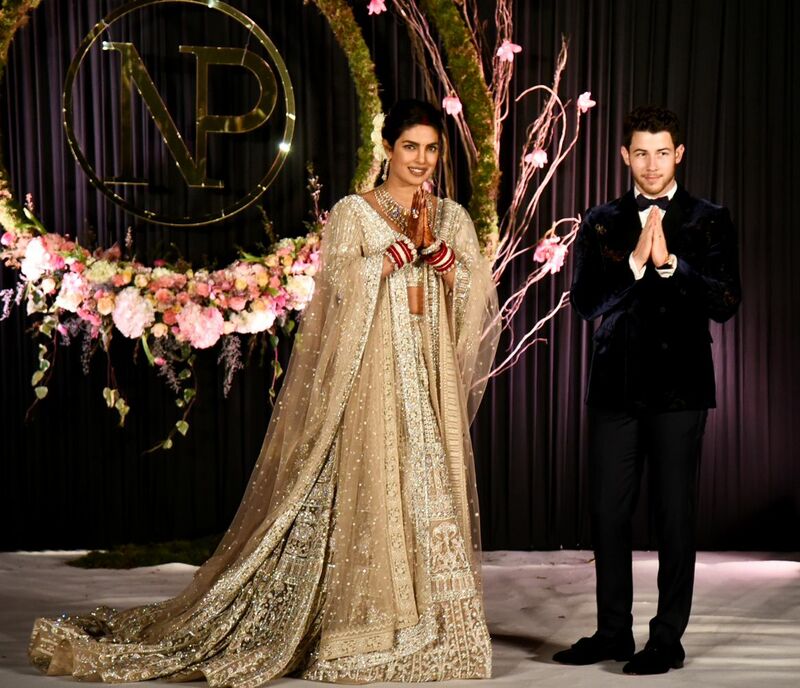 Priyanka Chopra and Nick Jonas are hosting their Delhi reception today, December 4 at the Taj Palace Hotel. Many close friends and family will be attending their reception ceremony including Prime Minister Narendra Modi. Priyanka donned a gorgeous gold and silver embelished lehenga while groom wore a black tuxedo. In their reception pictures Priyanka and Nick can be seen welcoming the guests. Priyanka never forgets to ‘namaste’ her fans no matter wherever she is, she makes sure that she greets her fans with a ‘namaste.’ Even in her reception pictures ‘desi girl’ welcomes the guests with a warm smile on her face and ‘namaste.’ Not just Priyanka, Nick too did the same and stole everyone’s heart. 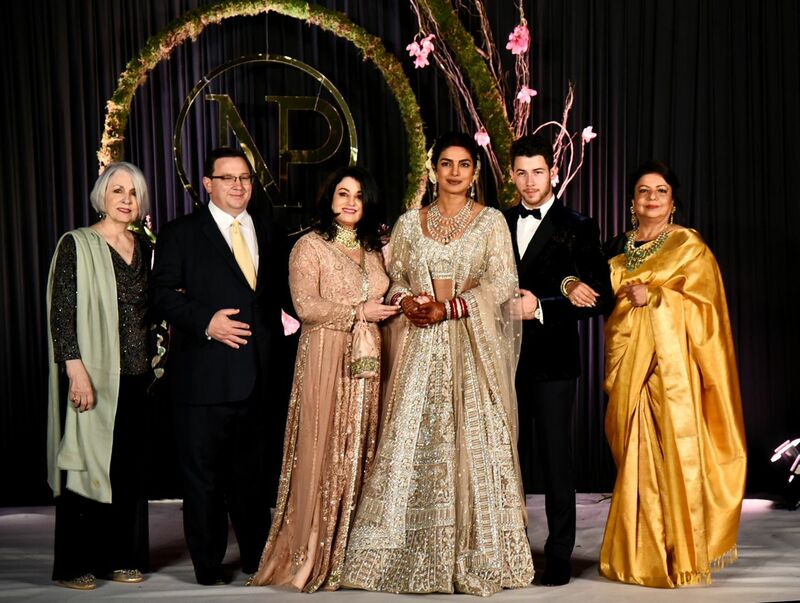 In another picture, PeeCee and Nick pose with their family. Nick’s parents Paul Kevin Jonas Senior and Denise Miller-Jonas, brother Joe Jonas and sister-in-law to-be Sophie Turner posed for the camera along with PeeCee’s mother and brother. Prime Minister Narendra Modi, who was campaigning in Rajasthan yesterday for the assembly elections, flew all the way back to Delhi to attend Priyanka’s engagement. Priyanka’s mother Madhu wore a bright yellow saree with a green blouse and diamond neck piece. PeeCee’s brother went all ‘desi’ and donned a cream kurta pyjama with a dotted jacket. Game Of Thrones star Sophie Turner – Sansa Stark was looking flawless in a peach lehenga while her fiance Joe Jonas wore a blue suit. Nick’s mother Denise Miller-Jonas wore a peach lehenga while Paul donned a black suit. The couple tied the knot in two ceremonies – Christian and Hindu wedding. The Christian was held on December 1 while the Hindu wedding was held on December 2 at Udaipur’s Umaid Bhawan Palace Hotel.